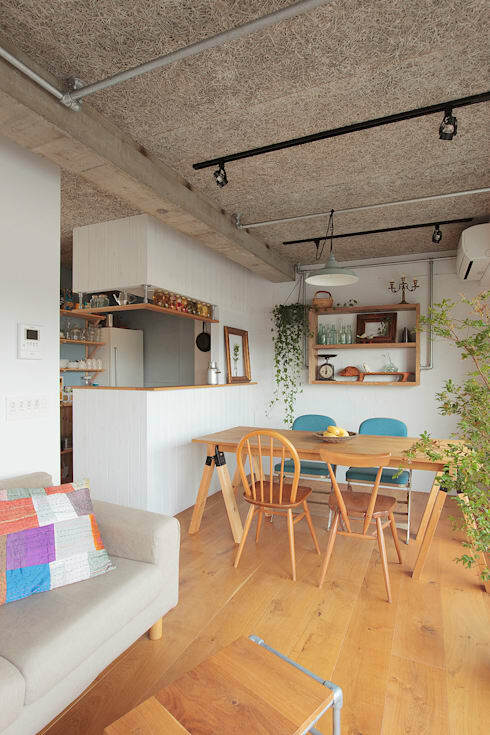 Today, you will get to witness how a tiny and gloomy apartment in the Kanagawa Prefecture of Japan was transformed into a bright and happy abode with some clever and tasteful touches. This compact home was once lying in a drab and neglected state, before the architects at Koji Koji – An Architect Firm realised its hidden potential. 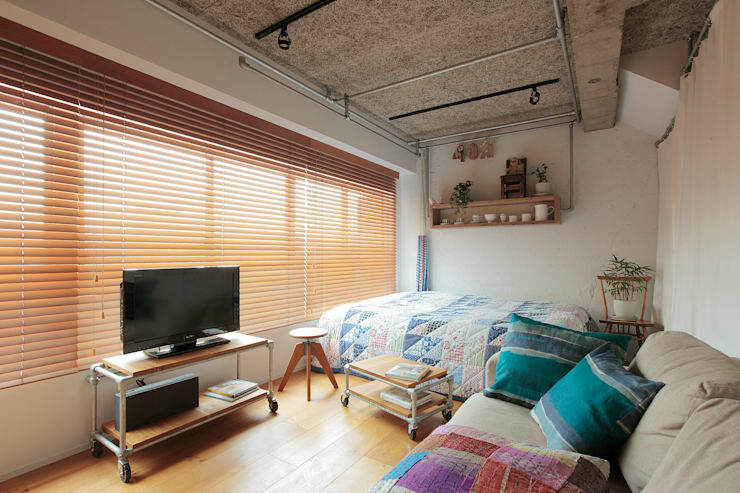 Thanks to their creativity and vision, the apartment is now replete with warm and cosy hues, homely textures, simple but clever storage hacks, and quaint vintage touches. Indoor greens lend a dose of serenity and natural charm too. Dark wooden accents and yellowing walls made the interior of the home look dreary and uninviting before. But the long stretch of space could be used in a more fruitful manner by bringing in some trendy furnishing and functional designs. 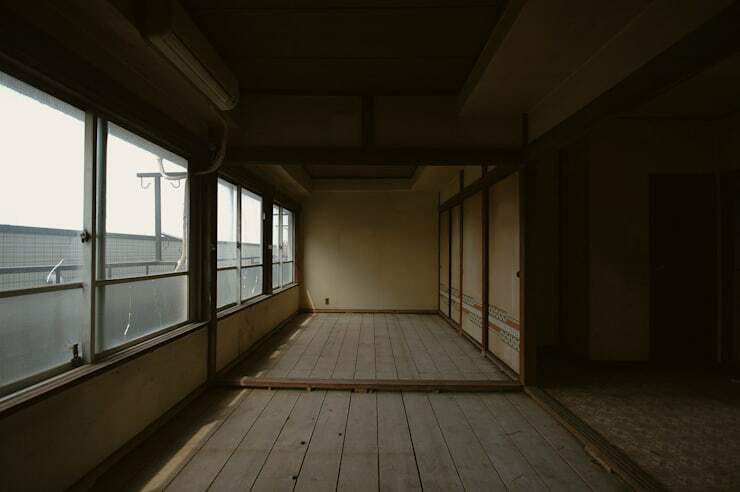 The array of large windows also promised a sunny future for the home. With bright white dominating the walls and light-hued wood for the floor, the apartment now looks incredibly different from the sorry state we saw before. By following an open plan layout, every little nook and cranny has been efficiently utilised, and distinct spaces flow into each other stylishly. Simple, practical and chic furniture and useful shelves dot the interiors for homely elegance. Cheery shades of blue, purple, red and pink infuse the living space with oodles of fun and visual interest. Plump cushions add extra comfort to the sofa, while a patterned quilt on the bed lends pizzazz to the simple setting. Trendy tables on rollers and quirky stools lend utility, along with a neat rack on the wall. Pretty potted greens fill the zone with freshness. Neat and stylish racks like this are visible throughout this residence, since floor space is a premium. They cater to storage and are ideal for displaying collections too. 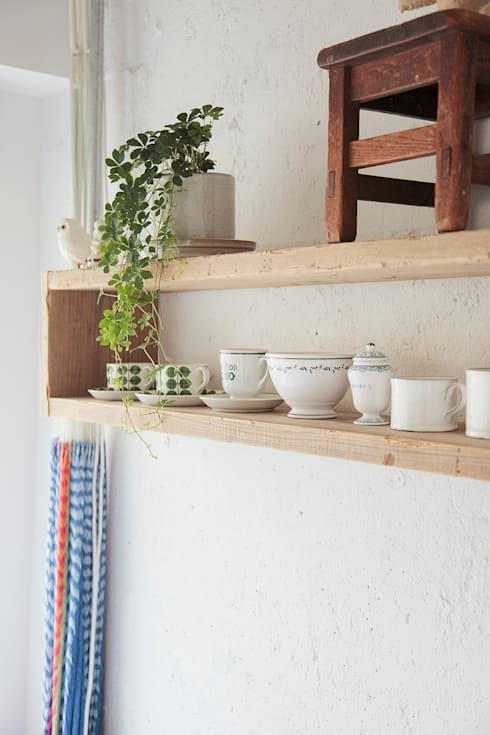 This shelf for instance houses quaint cups and saucers, which also look pretty. A porcelain bird and a potted green add on to the aesthetic appeal. The cooking and dining zones lie right next to each other, and both enjoy proximity to lush indoor greenery. The compact but sensible kitchen comes with multiple shelves for storage and a rack over the counter to hold spirits and glasses. And the dining arrangement wows with its sleek wooden table, slender wooden chairs with quirky backs, and a couple of blue and chrome chairs for intriguing texture play. Wooden fibres for ceiling insulation, exposed steel pipes and industrial style focused lights add to the aesthetic layers of this home. The overall look is highly individualistic and fun. 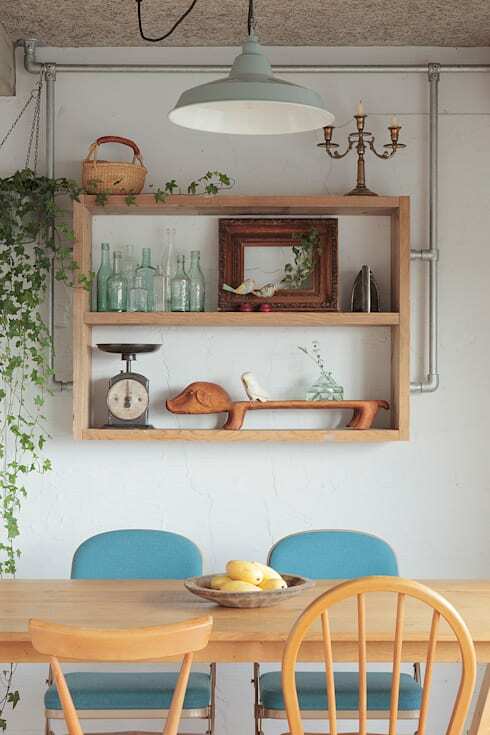 Now let’s take a closer look at the wall-mounted shelf behind the dining table. The quaint and vintage charm of the shelf here is due to the artefacts it holds. A cluster of empty glass bottles, a nostalgic wooden photo frame, a couple of birds, a food weighing machine, and a funnily longish dachshund sculpture are the highlights of this nook. An old-fashioned candleholder and a small wicker basket enhance the vintage appeal too. 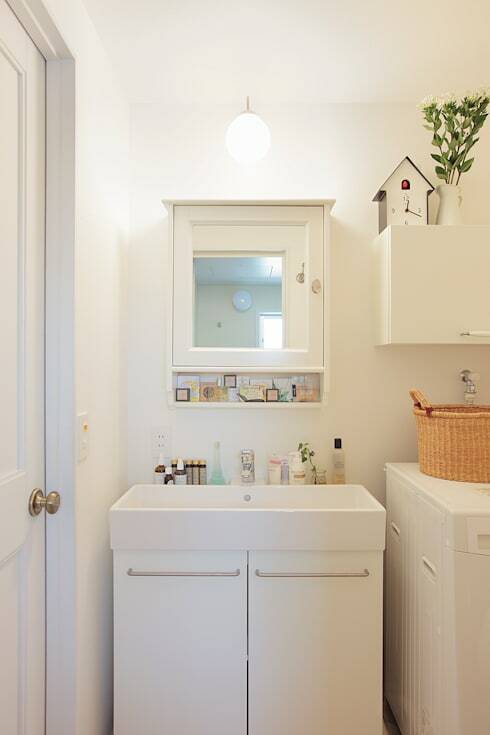 White rules the small bathroom of this apartment and lends the illusion of spaciousness, while sleek and useful cabinets cater to storage needs. We love how the mirror cabinet not only stores stuff behind the mirrored door, but also has a tiny shelf underneath for arranging more toiletries. A wicker laundry basket lends rustic charm to the space, while the clock shaped like a birdhouse makes for a quaint touch. 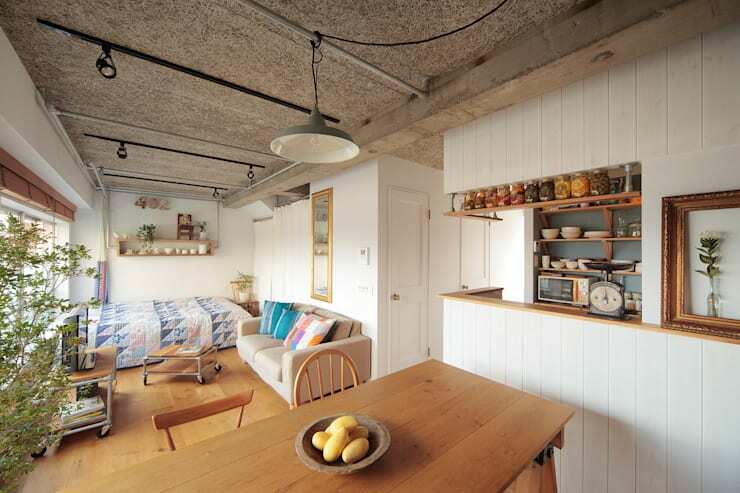 The happy, charming and extremely functional makeover of this once glum and bare apartment has left us impressed. For more ideas, check out another before and after story - This Old House Transforms Into A Modern Minimalist Fantasy.